When Onions turn golden brown add coriander powder and turmeric powder & chili powder and Salt to taste and fry for 1 minute. Add Tomatoes and Tomato Paste/Puree/Sauce stir it well and fry till the oil leaves from the sides. Cut Eggs in Half (vertically) and add to the gravy and stir it slowly so that it gets dipped in gravy. Garnish with 1 chopped Green chilies and Onion rings. Serve with Paratha’s, Chapati’s or Rice. Extra virgin olive oil is only used as a dressing for salads and dips. Only plain olive oil is used for cooking and sauting. No Bengali, in their right mind will put all these spices in Egg curry. Only things you need here is onion, garlic, red chilli powder, pinch of sugar and salt to taste. And ofcourse oil to cook. Tomato in egg curry is a complete NO. It spoils the flavor of egg. And for egg curry, you should choose duck egg instead of chicken. Thanks Monarma for trying this. What an amazing recipe. I m new to cooking. I tried this recipe without tomatoes and instead put chilly and tomato ketchup...still it came out very well. Thanks a ton for the recipe. hey chitra...if i m not mistaken u r my classmate in HISPANIA....this is a nice recipe..hoping to see much more gud recipes from ur side..well wanted to talk to u abut some multi cuisine stuff...hope u contact me..my email id - anks82003@yahoo.com.... keep it up..tc bye.. 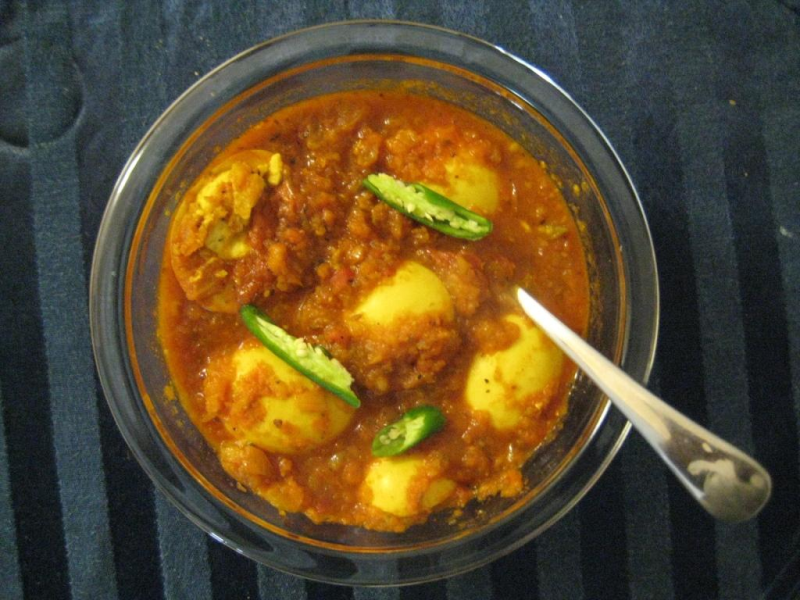 Egg curry taste good.just if you deep fry the boiled eggs before adding it taste really good. Hi chitra Too good yaar. I am loving it. hey! chitra............jus came across ur recipe....first thing which came in2 ma mind was..dats its easy n quick n handy 2 make....so will try it out n let u knw! thanks! Hi Chitra..Very nice recipe..i tried this ..it was really really delicius..thx alot..
HI,Chitra its really very nice dish it was so yummy dish. Hey dis recipe is so good....... it take very less time.... and very easy to prepare...!!! Dear Chitra, Your recipe seems to be excellent and eventhough I have not yet tried but while reading your contents and method of making it I am really excited and willing to make it soon for my husband.